We knew when we announced the launch of GIVE FOR FRISCO last spring in partnership with Mayor Jeff Cheney’s office that this initiative would have an impact across our city, but we couldn’t have foreseen how much. 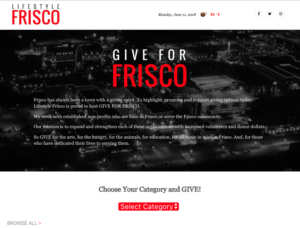 Since its founding five years ago, Lifestyle Frisco has been looking for a unique way to support and promote the nonprofits in the community. GIVE FOR FRISCO is the best way for us to do that… by sharing our extensive digital audience to strengthen the brands of all the nonprofits involved. Today, we are thrilled to announce that Mayor Cheney will officially decree February 14th, Valentines Day, as “GIVE FOR FRISCO Day“ every year from now on, and to celebrate, we encourage you to participate by giving JUST $14 to the charity, or multiple charities, of your choice through their GIVE FOR FRISCO page. All you have to do is either “Select” the category of your passion, which will filter the organizations, OR you may browse all nonprofits participating. To help build awareness and support for our nonprofits, our goal is to make this the largest annual community-wide giving event in Frisco. Each year on February 14, Valentine’s Day, we want this online event to transform from an idea helping raise awareness of nonprofits, to a city-backed movement to ignite a broader culture of giving. GIVE FOR FRISCO is FREE of charge to all established nonprofit organizations who are based in Frisco and/or serve the Frisco community.